As self confessed foodies, cooking is something that we love to do, especially when it comes to pairing new flavours with our delicious pork pies. We're very seasonal - we love using vegetables and fruits that we can get that season but also ones that reflect the weather outside; comforting rich and warm foods during the colder months and lighter foods during the summer full of zesty flavours. That's why this Summer we've been enjoying making our mango and pomegranate coleslaw. Make enough for your meal and keep some in an airtight jar in the fridge to enjoy the next day. If you need more mayo: ingredients ratio, just add more in! And there you have it! A super easy mango and pomegranate coleslaw that pairs perfectly with a pork pie whether that’s at a picnic or for a light lunch with some salad too. You can also add in different fruits to customise this recipe – green apple, mandarin orange or raisins for example. We’d recommend trying this with all our pies, but perhaps try it with our medium pork pie or cheese and pickle snack pork pies if you’re having it as a meal with salad to make sure it’s a filling meal! There’s so much to think about when it comes to summer flavours; if you’re like us and enjoy seasonal food from the local area, Yorkshire is producing some delicious foods right now. Try a pork pie and plum sauce or locally grown cauliflower which is easy to make into cauliflower rice by simply whizzing and pulsing in a food processor before warming in a skillet with some olive oil or butter – a lighter tasty alternative to rice when it’s warm outside. Or how about going to a strawberry farm, picking your own fruit and then making it into a summer strawberry salad with a drizzle of salad dressing. So there you go! 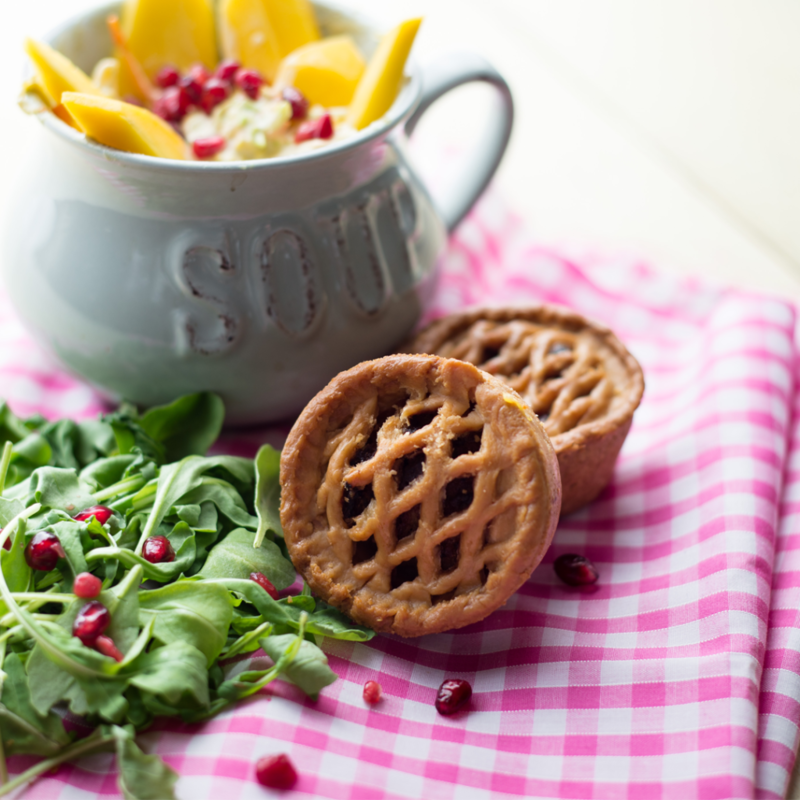 An easy but really tasty recipe, let us know if you try this recipe and which pork pie you eat your homemade mango and pomegranate recipe with!